India were bowled out for 151 in their second innings, chasing 287 to win. It was inevitable. India lose the Test by 135 runs after being bowled out for 151. Mohammed Shami and Jasprit Bumrah depart in quick succession as South Africa complete the rout. They now lead 2-0 in the three-game rubber. 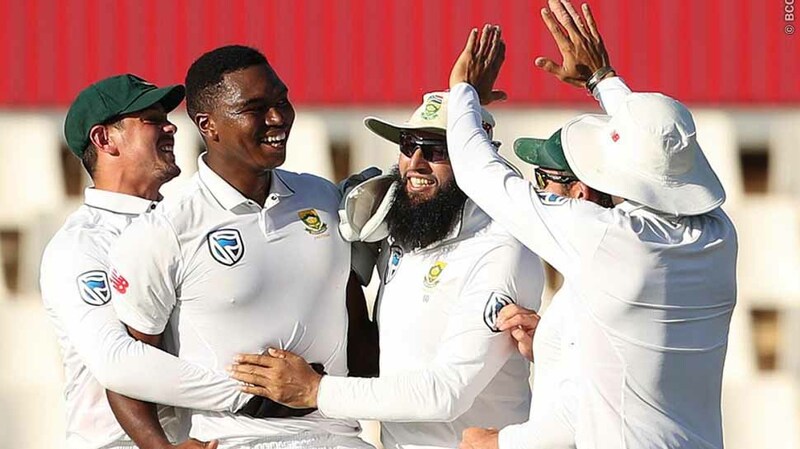 Excellent debut for Lungi Ngidi, who took six wickets in the second innings. Lunch has been extended by 15 minutes due to fall of the eighth Indian wicket as Ishant Sharma walks in. Expect the bouncer barrage to continue as SA deploy silly point and short leg to their pacers. Just when it looked India will go to lunch seven down, Rohit (47) chose to take on Rabada with a hook shot but found the ball in the hands of AB de Villiers who took a fine diving catch. India 141/8, chasing 287 to win. 50-run up between Rohit Sharma and Mohammed Shami. Rohit gets two fours off this Kagiso Rabada over. Hang on, there is also a drop catch off the penultimate ball of the over. Rohit pulls it hard and Hashim Amla spills it at square leg. India 138/7 after 46 overs. Rohit 44*, Shami 24*. India need 287 to win. Believe it or not, the partnership between Rohit Sharma and Mohammed Shami has now gone up to 35 now and latter has contributed 20 in that. On a wicket where the famous Indian batsmen have struggled beyond belief, Shami, a tailender, appears to have found some solution. India 122 for 7 in 43 overs, Rohit 33*, Shami 20* in pursuit of 287. Rohit Sharma goes on the attack and takes a four and a six off the Keshav Maharaj over. 100 up for the tourists. He is India's only hope, but are we hoping against hope? That's the question. Rohit 31*, Shami 6*. India 104/7 after 39 overs, in pursuit of 287. Wicket alert: Lungi Ngidi takes his fourth wicket, has Ravichandran Ashwin caught behind for 3. All over bar the shouting for the touring team. India 87/7, need 200 more to win. Wicket alert: Another one goes for India. It's Hardik Pandya who ramps into the hand of a jumping Quinton de Kock behind the wickets. That's no way to get out in Test cricket but that's how he plays his cricket. One can only mourn. India 83/6, need 204 more to win but nobody is going to put their money on them. It appears India will be 2-0 down soon. Stupendous diving catch by Morne Morkel at deep fine leg. Parthiv Patel (19) pulled Rabada and the ball looked to going away from Morkel running to his right but he made a perfectly-timed drive to complete a stunning effort. India 65/5, need 222 more to win. Early blow to India. Pujara (19) has been run-out for the second time in this match. That was one wicket India didn't want to lose. But it's 249/4, which leaves India 238 more to win. Rohit Sharma is the new man in. The enormity of the task can be gauged by the fact that the highest total chased at this venue is 251, which was done by England 17 years ago. And as we speak, Kagiso Rabada has started proceedings for South Africa. Decisive day for India in this Test series. But at 35/3 and still 252 runs away from their target of 283, it's an uphill task against a bowling attack in form and a pitch that's playing up and down. Pujara (11*) and Patel (5*) will resume for India and the first session will decide if India have any more fight left in them.